What would you do with a few extra fingers and toes? A family of football and music lovers are able to take their hobbies to the next level thanks to a unique genetic anomaly which has left them all with six fingers on each hand. It makes it easier to strum guitars, play the piano and coming from Brazil – a country where football is the most popular sport – makes the position of goalkeeper seem a cinch. 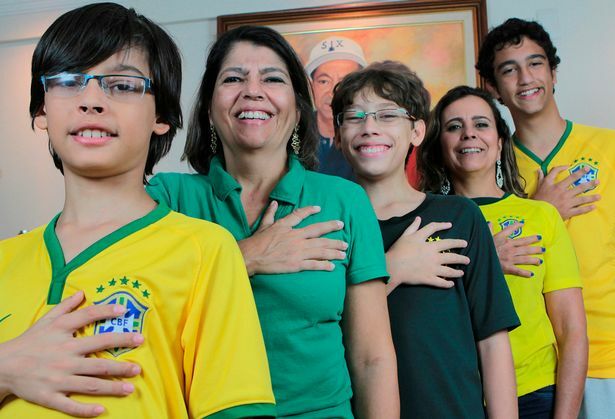 Members of the Da Silva family were born with more fingers than the rest of us and instead of five digits on each hand they have six. Out of 26 members of the family 14 have one extra finger on each hand, meaning manicures cost a bit more than for the rest of the population and when it comes to sports they have quite an advantage. Joao de Assis da Silva, 15, preferred position is goalkeeper and said: “It’s good because my hands are bigger than other people and I have a better grip and can hold the ball much better than people with five fingers. I’d definitely play guitar and I’d write things that people with fewer fingers could never play. Here is an x-ray of a type of ulnar polydactyly. The extra digit is most common on the ulnar (little finger) side of the hand, less common on the radial (thumb) side, and very rarely within the middle three digits. Understanding our own genetic code and how to change it will give us many new options. How many fingers would you like your new baby to have, Mr. and Mrs. Jones?